It is supposed to be quite limiting by some women, but still, medium-length hair is more versatile and cool than they can ever imagine. This length is an ideal background for beachy waves, as well as for chic choppy layers and other such dos. So here, we have a cool array of medium-length hairstyles for women with any face shape, if you want to go for some fresh and creative hairstyles in the new season! Having some touches of the retro style, the amazing hairstyle of Katy Perry suggests a nice way of styling her jet-black hair into a side-parted luxurious do with the super curly finishes for the tips. The gently face framing hair is also noteworthy for the chic results. Ad‚Äö√†√∂¬¨√Üle Exarchopoulos suggests having your medium length hair natural and cute as never. Her slightly beachy waves-resembling hairdo is made of some effortlessly left hair with a central parting and a very charming effect. Amy Adams has a nice surprise for those, who like using headwear accessories like headbands for their dos. Thus, she is spotted having her all straight medium length hair secured with a shiny black metallic headband for ultimate and natural chic. If you prefer medium haircuts with bangs, then try the look of Frieda Pinto, who has another way of creating a straight hairdo with some side-swept bangs and overall glossy looks. Another variant of making a messy and effortless hairdo is doing it like Sienna Miller, who picked a naturally wavy do tucking the side hair behind her ear, accentuating the central parting even more. Emily Blunt is the next celeb is our list, who shows how to make a subtly wavy and a bit voluminous do with a central parting and cute blonde shade of hair. This is very suitable for bright lips, too. Keira Knightley suggests just another way of wearing beachy waves for darker shades of hair like hers. This time it’s the chic slightly side driven parting and the side moving framing hair that made up her cool party look. In order to accentuate her hair color plays even more, Kerry Washington opted for a super effective side-swept hairstyle, having some face framing curly hair for the front, and cute curls for the rest, too. The retro feel is also noticeable here. Just another do for combining the straight top with curly finishes and putting all that on the background of side parted looks is presented with the hairdo of Erika Christensen, suggesting this do for her impressive and cute blonde locks. Jessica Alba is also here for us, presenting her say about the medium hair chic. Her option is the charming side-parted look, with subtly wavy touches and a striking shade play of hair. Gwyneth Paltrow in her turn introduces a way of combining the popular side parted look with all straight shiny blonde locks. This IS effective. Rose Byrne offers her alternative of creating beachy waves, making them more emphasized and cool, and going for curly locks rather than subtly wavy ones. Kristen Dunst’s looks come to prove that the medium length hairstyles, especially those made with some curly finishes, work with all the hair shades. Hers is the example of combining these dos with the light blonde shades. Gia Coppola for one of her party looks, suggested having a minimalistic straight do adorned with a tiny curled out finish for the tips. The central parted bangs are also descriptive for this do. Medium length is also the side sweep with curls. 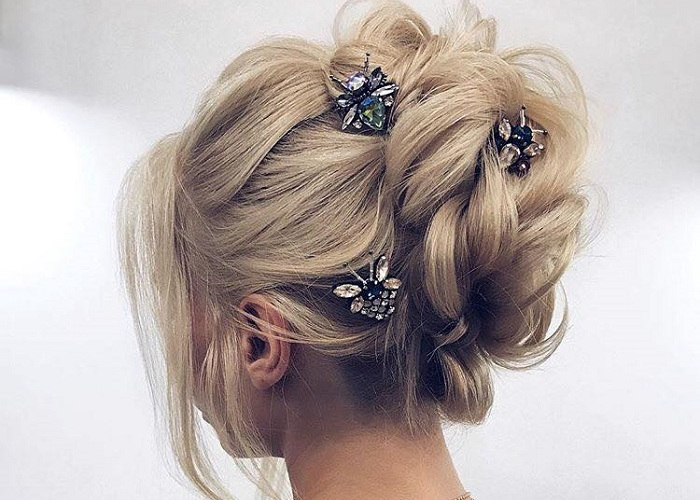 This is the formula of Scarlet Johansson’s party hairstyle made with her cute blonde hair. Rachel McAdams marvelously styles her auburn hair with the medium length, too. What she chose for one of her party looks is the central parted do with the curly finishes and a bit of volume for the whole. The next exemplar of pure chic set with the medium length hair is the option of Olivia Wilde, who styles her totally straight hair with a deep side parting and sleek looks. Heidi Klum opts for what is called the usual elegance. Her choice for a party hairstyle is the classy central parted do with voluminous and big curls from top to tips. Finally, the last option of medium length hair comes with the retro inspired look of Alexa Chung. Who picked the finger waves and the retro side parting as her key looks for medium hairstyle. So look through these gorgeous medium hairstyles for any face shape, get inspired and enjoy your perfection made of medium hair, which does work with any style and any hair shade.